Accessing large amounts of information is an area where computers have an obvious advantage over humans. This, along with being better at playing the buzzer, allowed Watson to win on Jeopardy this week. 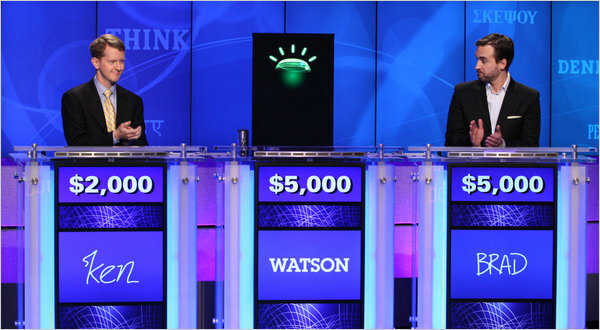 Watson had an advantage in answering questions due to being programed with the information from a massive number of reference books, but even simpler systems are providing benefits to us mere humans. At present I can ask my Droid a question out loud. While I do not receive a verbal response like those given by Watson, the screen does display the results of a Google search with pertinent information along with information within the Droid. Besides typing in or speaking questions, searches can even be done based upon pictures. For example, yesterday I was wondering where a picture on the cover of a book was taken. The Droid ran a search and gave me information on the resort where the picture was taken along with identifying the picture as the cover of the book where it was obtained. I will be looking forward to purchasing one for my office. At present, simply having a Droid in my pocket with web access and several medical references, along with computers in the exam rooms, makes things much simpler than in past decades to quickly obtain whatever information is necessary. Or course the fictitious inventors of HAL probably intended to develop a computer to assist the crew as opposed to killing most of them. 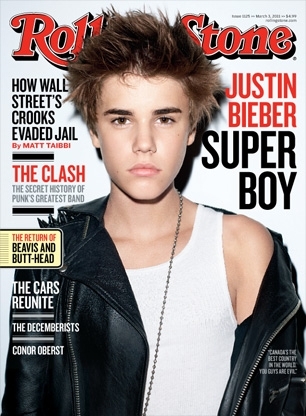 It comes as no surprise that Justin Bieber is on the cover of Rolling Stone. Consider how often he is on television or in magazines I suspect the kid has the best publicist ever. I’m just not sure why anyone would care about an interview regarding his political beliefs. Regardless, it has become impossible to ignore him. When he says he wouldn’t “be able to judge that,” hopefully this means he understands the difference between expressing personal opposition to abortion and imposing this view upon others. There is at least one good thing about all the hype Justin Bieber is receiving. I think the media might finally have moved on from covering all the ridiculous Tea Party protests. Now they are concentrating on even more intense protests–Justin Bieber fans protesting that Bieber didn’t win the Best New Artist Grammy Award. Both the Tea Party and Justin Bieber fans are waging protests of comparable intellectual significance.